Be consistent. Episode 16, Marketing For Owners the Podcast. A short and sweet title today, Be Consistent. Consistency is what people get used to. They like it, we all like it. Think to yourself, when is the news on the TV? Same time everyday? Every single day? Do we know when the news is on the TV? Yes we do because it’s consistent. Do we know when the traffic news is on the radio? Do we know when the news is on the radio? Do we know when Christmas is going to come? I know it sounds like pretty bad examples but it is consistent. Now how do you apply that to your marketing in your business? Take social media for example. When you start using Twitter seriously as a business, you need to be consistent. You can’t dive in for a few tweets, and then come back a week later cause you got busy. Once you start, if you’re going to put the effort into following people and impressing people, then they are going to expect to come and find you again. Now what will happen if, for example, one day you put out 10 tweets, the next day you put out 9 tweets, next day you put out 10 tweets again. Then you get busy, you go away. Those tweets could have been killers, absolutely fantastic. So followers would come back to your stream. They’ll come back the next day, the next day but when they see that there’s nothing coming, when they have a look at the following day and there’s still nothing coming in, that’s it done, gone. People are fickle. People do not have patience. They don’t need it. There are many options, it’s not just you. You’ve got to work hard at this stuff. So be consistent. Blogging. How many websites have you seen where someone’s had – and please tell me, it doesn’t happens to yours – where you have a new website design, you put a section called “latest news”. The web developer who asked you for four articles and added them in. Each entry has a date on it. And you have no idea how to upload new content (because it’s not a real blog) but you see the old date on there. Is that impressive? When you look back and it says, 12th of April 2012, what do you think? That’s not consistent. Once you start with something, you’ve got to do it all the time. So get blogging. You don’t have to blog everyday. You can blog once a week. You can blog once every two weeks. But be consistent. People will get to understand the pattern and they’ll look out for it if it’s good content, the content they want, which is what you going to be giving them. They will want it. They will get used to it. So please try your best to do it in same pattern. Now as time goes on, you can slowly increase that consistency or if you are going too fast, you could slowly decrease the consistency. But be consistent. Be consistent in your branding, everything. Just think. 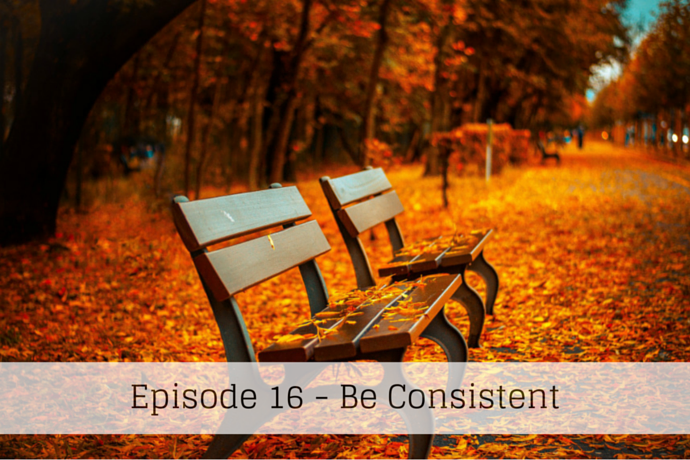 Are you being consistent? It’s a Monday? So we need a book. Now here’s someone who is pretty consistent. Today I’m going to recommend a book called Likeable Social Media. It’s written by Dave Kerpen. Very clever, very appropriate because he gives examples of businesses and how social media is applied, how he has used it. 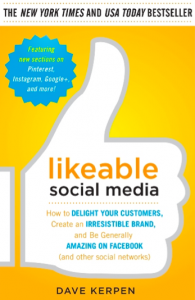 Dave has a very successful business called Likeable Media. He make a business out of it and you can’t get better than that from someone who’s made money doing what he says. It has a lot of examples you can apply to your business and make you think. Rainmaker sponsors this episode of the Marketing For Owners Podcast. Rainmaker is from the people at Copyblogger Media. It is a platform that hosts and creates websites. It’s all you need and you can be consistent with that because I show you how. Go take a look. See you tomorrow.